Replenish dull and dry complexions with the Hydra-Filler Cream from Filorga; a rich, anti-ageing moisturiser that instantly replenishes and hydrates skin. 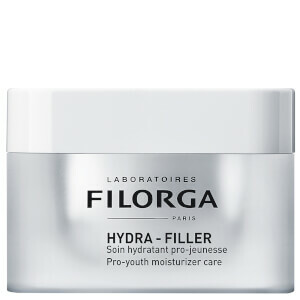 Fortified with a powerful combination of micro-fragmented and high molecular weight Hyaluronic Acids, the smooth formula drenches skin with moisture, seeking to fill the appearance of fine lines and wrinkles while stimulating natural collagen production levels for a visible plumping effect at the dermis. Suitable for all skin types, the face cream leaves you with a refined and revitalised complexion that feels smooth, soft and supple. 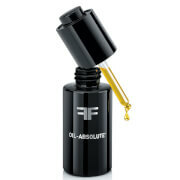 Apply generously, morning and/or evening to a clean face, neck and décolleté. 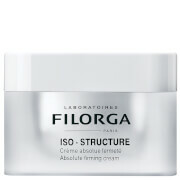 Apply directly to the skin, or over your usual Filorga serum. Massage in using the fingertips. Aqua, Ethylhexyl Palmitate, Cetearyl Alcohol, Isodecyl Neopentanoate, Glycerin, Synthetic Wax, Pentaerythrityl Tetracaprylate/Tetracaprate, Dipalmitoylethyl Hydroxyethylmonium Methosulfate, Polyquaternium-37, Polymethyl Methacylate, Sodium Hyaluronate, Steareth-21, Parfum (Fragrance), Ceteareth-20, Sucrose Palmitate, Caprylic/Capric Triglyceride, Chlorphenesin, Glyceryl Linoleate, Sorbitan Oleate, Prunus Amygdalus Dulcis Oil, Biosaccharide Gum-1, Sorbitan Laurate, Isopropyl Alcohol, Potassium Hydroxide, Glyceryl Caprylate, Sodium Anisate, Sodium Levulinate, Salicornia Herbacea Extract, Phenoxyethanol, Methylisothiazolinone, Citric Acid, Potassium Sorbate, Myristyl Malate Phosphonic Acid, Tocopherol, Sodium L Vhloride, Glucose, Potassium Chloride, Calcium Chloride, Magnesium Sulfate, Glutamine, Sodium Phosphate, Sodium Acetate, Ascorbic Acid, Lysine Hcl, Arginine, Alanine, Histidine, Valine, Leucine, Threonine, Isoleucine, Tryptophan, Phenylalanine, Tyrosine, Glycine, Polysorbate 80, Serine, Deoxyadenosine, Cystine, Glutathione, Cyanocobalamin Deoxycytidine, Deoxyguanosine, Deoxythymidine, Asparagine, Aspartic Acid, Ornithine, Glutamic Acid, Nicotinamide Adenine Dnucleotide, Proline, Aminobutyric Acid, Methionine, Taurine, Hydroxyproline, Glucosamine, Coenzyme A, Glucoronolactone, Sodium Glucuronate, Sodium Uridine Triphosphate, Thiamine Diphosphate, Disodium Flavine Adenine Dinucleotide, Nicotinamide Adénine Dinucléotide Phosphate, Retinyl Acetate, Inositol, Methyl Deoxycytidine, Niacin, Niacinamide, Pyridoxal, Pyridoxine, Biotin, Calcium Pnathothenate, Folic Acid, Riboflavin, Tocopherol Phosphate.